There are some movies which are released without any promotions owing to their limited budget. Some of these movies are so amazing that you regret why didn't you know about them when they had released. I was astonished when I saw Mumbai Meri Jaan and Khosla Ka Ghosla later as a friend had left the DVD at my home. 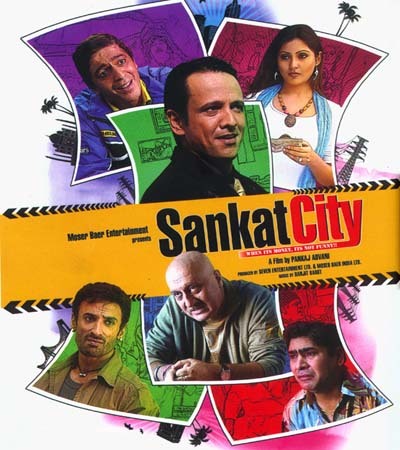 I had tweeted about them in reply to which a friend recommended me to watch Sankat City. Unfortunately, I couldn't get it anywhere in all these years and finally I have watched it this weekend after almost 6 years of its release. How poor of me! Pankaj Advani has used this movie as a genre of dark comedy which very few audiences in India prefer to watch. Right from the first scene of the movie, director have assured that he isn't wasting time in showing useless scenes which aren't relevant with the plot. What matters is shown and therefore, the movie is nicely edited. Yes, it does become little repetitive and stagnant after interval but picks up the pace right after that and entertains again in the pre-climax and climax. The movie isn't about philosophy or social message but about several characters in Mumbai who want to make big money in lesser time because of which they keep getting trapped in something or the else. The characterization is done so wonderfully that you can relate with the emotions of each character nicely which makes this movie watchable and interesting. The twists keep getting unfolded one after another which increases the curiosity in the audience about what would happen next. The climax is also very well put up which does not spoil the whole effort inputted in the movie. Coming to the performances, KK and Anupam Kher are par excellence and you will love watching them. Rimi Sen comes as a surprise and acts very well. Rest, all the other actors have done perfectly in their parts. I wished if the cinematography could have been done in a little bigger scale but the budget justifies the act. In all, Sankat City proves to be an unmissable movie and I wish if its 2nd part is released which will definitely get mention in this period as many directors have started taking risks of showing different kind of cinema. I give this movie 3.5 stars out of 5.